Abstract: Gestational diabetes mellitus (GDM) is associated with an increased risk of complications for both mother and baby during pregnancy as well as in the postpartum period. Screening and identifying these high-risk women is important to improve short- and long-term maternal and fetal outcomes. However, there is a lack of international uniformity in the approach to the screening and diagnosis of GDM. The main purpose of this review is to provide an update on screening for GDM and overt diabetes during pregnancy, and discuss the controversies in this field. We take on debatable issues such as adoption of the new International association of diabetes and pregnancy study groups criteria instead of the Carpenter and Coustan criteria, one-step versus two-step screening, universal screening versus high-risk screening before 24 weeks of gestation for overt diabetes, and, finally, the role of HbA1c as a screening test of GDM. This discussion is followed by a review of recommendations by professional bodies. Certain clinical situations, in which a pragmatic approach is needed, are highlighted to provide a comprehensive overview of the subject. GDM is associated with an increased risk of complications for both mother and baby, during pregnancy as well as in the postpartum period. Screening and identifying these high-risk women is important to improve short and long-term maternal and fetal outcomes.4 However, there is lack of international uniformity in the approach to the screening and diagnosis of GDM.5 This is surprising, given that the strategies for making a diagnosis of diabetes mellitus are uniform across the world.2 The main reason for the diagnostic dilemma of GDM is the large number of procedures and glucose cutoffs proposed for the diagnosis of glucose intolerance in pregnancy.6 The first diagnostic criteria proposed by O’Sullivan in 1964 and its subsequent modifications (Carpenter and Coustan) were based on the maternal risk of developing type 2 diabetes, rather than on pregnancy outcomes. Recently, the recommendations from IADPSG attempt to redefine GDM in terms of adverse pregnancy outcomes, based on Hyperglycemia and Adverse Pregnancy Outcome (HAPO) study results.6 But, we are still far from attaining a holistic criteria which is based on both short and long-term outcomes. The main purpose of this review is to provide an update on screening for GDM and overt diabetes during pregnancy, and discuss the controversies in this field. We take on debatable issues such as adoption of the new IADPSG criteria instead of the Carpenter and Coustan criteria, one-step versus two-step screening, universal screening versus high-risk screening before 24 weeks of gestation for overt diabetes, and, finally, the role of HbA1c as a screening test of GDM. This discussion is followed by a review of recommendations by professional bodies. Certain clinical situations, in which a pragmatic approach is needed, are highlighted to provide a comprehensive overview of the subject. The initial recommendation for using 75-g OGTT in pregnancy was from the World Health Organization (WHO). The WHO used the same criteria for diagnosing diabetes both during and outside of pregnancy.11 This approach was criticized, as it ignored the physiological changes in carbohydrate metabolism that occurs during pregnancy. In 1999, the WHO11 lowered the threshold for FPG from 7.8 mmol/L (140 mg/dL) to 7.0 mmol/L (126 mg/dL) and recommended that pregnant women meeting the criteria for diabetes mellitus or impaired glucose tolerance (IGT) be classified as having GDM. Controversy: should IADPSG criteria be adopted universally? The prevalence of GDM increases by two- to threefold if the IADPSG criterion is adopted for screening. There is an ongoing debate whether such an increase in prevalence allows identification of previously ignored risks, or results in overmedicalization of healthy pregnancies.5,15–20 There is a need to closely look at arguments on both sides. Two landmark randomized trials performed by Crowther et al (ACHOIS) and Landon et al (Maternal-Fetal Medicine Units, MFMU) influenced the recommendations for GDM diagnosis, by IADPSG.21,22 Analysts point out that these two trials were different from the HAPO study and should not have been considered along with it.16,17 The broad differences between them and the HAPO study are discussed here. Trial design: These were intervention trials to investigate the effect of GDM treatment (diet and/or insulin) on perinatal outcomes, whereas the HAPO study was an observational study. Inclusion/exclusion criteria: Unlike HAPO, where women irrespective of previous GDM were included, both studies excluded women with such a history. Diagnostic criteria: Both studies used a two-step diagnostic procedure but with different diagnostic criteria. The criteria for the ACHOIS study were positive 50 g glucose challenge test (GCT) at 24–34 weeks’ gestation (≥7.8 mmol/L) and FPG ≤7.8 mmol/L and 2 hours value 7.8–11 mmol/L on 75-g OGTT. For the MFMU study, the criteria were positive 50 g GCT at 24–31 weeks’ gestation (7.5–11.1 mmol/L) and FPG ≤5.3 mmol/L and 2 or 3 postload levels elevated (1 hour >10.0; 2 hours >8.6; 3 hours >7.8 mmol/L) on 100-g OGTT. The MFMU study excluded women with FBG values >5.3 mmol/L (95 mg/dL), so the participants were less hyperglycemic than those of the ACHOIS cohort. The HAPO study used a single-step testing protocol without a prior GCT. Outcomes: Both studies included perinatal mortality as a serious outcome, unlike in the HAPO study, in which perinatal mortality was not a part of the assessment. In the ACHOIS study,21 the routine care group showed a higher prevalence (4% vs 1%) of composite primary outcome of “any serious perinatal complication.” However, some of the deaths could not plausibly be attributed to the nontreatment of GDM: for example, one infant had a lethal congenital anomaly, and another had severe intrauterine growth retardation. In the MFMU trial,22 no difference was found between the groups in the composite primary outcome score. In the ACHOIS study, the FPG value was used only to exclude women, initially using FPG 7.8 mmol/L (140 mg/dL) and changing it later to 7.0 mmol/L (126 mg/dL) after a change in the WHO recommendations. Thus, it would have been possible for women with marked fasting hyperglycemia to be included in this trial. However, as this degree of fasting hyperglycemia is very uncommon in pregnancy when the 2-hour plasma glucose is <11.1 mmol/L (200 mg/dL), this criterion was rarely invoked.15,21 Landon et al22 applied a much more stringent criterion, excluding women with FPG 5.3 mmol/L (95 mg/dL). Advantages of treatment of GDM: Both studies showed a reduction in complications with the identification and active treatment of mild GDM. This was seen in terms of mean birth weight, frequency of LGA,21,22 reduction in fat mass, and in the reduction of shoulder dystocia.22 Hypertensive disorders of pregnancy (gestational hypertension and preeclampsia) were also substantially reduced by active GDM treatment.21,22 Maternal weight gain was lessened by active therapy.21,22 Induction of labor was increased by active treatment in the Crowther study,21 but not in the Landon study.22 The frequency of cesarean sections was unchanged in the ACHOIS study,21 and reduced in the MFMU study.22 A subsequent systematic review concluded that the observed reductions in LGA, shoulder dystocia, and preeclampsia are consistent across these and other available reports.28 As for perinatal mortality, the HAPO study was not powered to detect a difference in perinatal mortality, and for ethical reasons, the protocol was designed to minimize the risk of perinatal mortality. The relationship between hyperglycemia and adverse pregnancy outcomes is well defined through a large volume of congruent observational epidemiologic data, which were also considered for IADPSG recommendations. The result of GCT is influenced by the timing of meals, and that of testing. 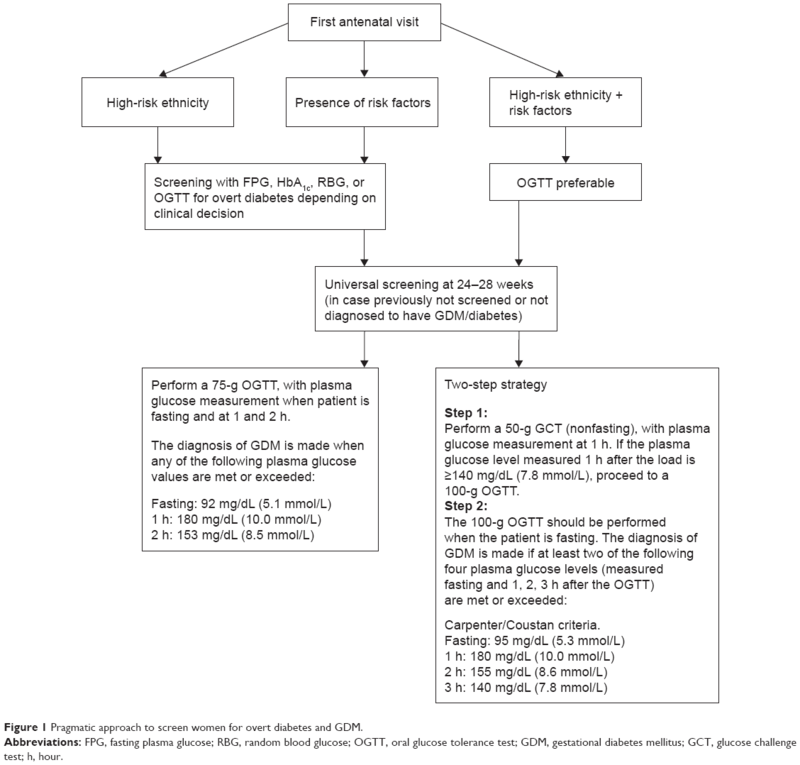 A recent study showed that among women with a positive GCT, those tested in the afternoon have better metabolic function and a lower risk of GDM on subsequent OGTT.41 This suggests that the time of testing may lead to misclassification of patients with markedly elevated GCT results if GDM is diagnosed without confirmation by OGTT. A recent prospective observational study randomized 786 pregnant women to screen for GDM either with a one-step method using a 75-g OGTT using IADPSG criteria (n=386) or with a two-step method with a 50-g GCT and a 100-g OGTT using the Carpenter and Coustan criteria (n=400), and then analyzed the prevalence of GDM using the one- and two-step methods. This study also aimed to determine whether women diagnosed as having normal glucose tolerance by the two-step method had any worse neonatal outcome than those determined to have normal glucose tolerance by the one-step method.42 Women diagnosed with GDM by either process were treated according to the local management protocol including endocrinology review, glucose monitoring, dietary advice, and medication if required. The one-step method had a GDM prevalence of 14.5%, and the two-step method a prevalence of 6%. Women determined to have normal glucose tolerance in the two-step method had a greater risk of preeclampsia and macrosomia compared with the women defined as having normal glucose tolerance in the one-step method. On the basis of their study, authors strongly advocate elimination of the two-step process. The advantages and disadvantages of the two-step and one-step screening protocol are summarized in Table 1. Abbreviations: GDM, gestational diabetes mellitus; GCT, glucose challenge test; OGTT, oral glucose tolerance test. Altogether, the findings suggest that an HbA1c measurement is not a useful alternative to an OGTT in pregnant women. The recommendations on various aspects of screening are summarized in Table 3. Abbreviations: ACOG, American College of Obstetricians and Gynecologists; ADA, American Diabetes Association; ADIPS, Australasian Diabetes in Pregnancy Society; IADPSG, International Association of Diabetes and Pregnancy Study Groups; OGTT, oral glucose tolerance test. Screening for GDM is an essential part of obstetric care. The only controversy is how to screen for the condition. The first diagnostic criterion proposed by O’Sullivan in 1964 and its subsequent modifications (Carpenter and Coustan) were based on the maternal risk of developing type 2 diabetes, rather than on neonatal outcomes. IADPSG, in contrast, attempts to redefine GDM in terms of neonatal and short-term maternal outcomes. But we are still far from attaining a holistic criterion based on both short- and long-term outcomes. Criteria based on the maternal risk of developing type 2 diabetes would appear to underdiagnose; whereas those based on only short-term outcomes may over diagnose GDM. A decision tree that balances neonatal outcome concern with maternal outcome and risk from treatment would seem to be the way forward, eventually. This requires more studies and data, of course. Even though the IADPSG criteria aim to improve the perinatal outcomes, it may not be practical or feasible for every country/center to adopt it universally. As per the WHO, each health care facility needs to assess their burden of hyperglycemia in pregnancy and decide whether and how it will implement programs to test for and treat such women.50 The WHO have proposed further strategies to overcome barriers of OGTT testing with compromise on missing some cases of GDM.50 But again, the suggestions are made on the basis of limited studies, and the applicability of the results of one study needs to be evaluated in the indigenous population before a particular strategy is adopted. While developed health care practices may follow a two-step method, a one-step approach may be more useful for situations where access or travel to health care centers is limited or arduous. The benefits of a second test, performed in a second visit, must be balanced against the cost and inconvenience of travel. Travel is also associated with health risks. However, if GCT is accomplished on routine antenatal visit, then a two-step strategy may be beneficial in such cases.5 The universal screening to rule out overt diabetes should, however, be adopted in ethnicities/countries with a high prevalence of diabetes.13 We summarize the pragmatic indications for the one- and two-step approaches on the basis of a biopsychosocial model in Table 4 and an overall pragmatic approach based on guidance from various professional bodies in Figure 1. Abbreviations: GCT, glucose challenge test; GDM, gestational diabetes mellitus; OGTT, oral glucose tolerance test; PCOS, polycystic ovarian syndrome. Figure 1 Pragmatic approach to screen women for overt diabetes and GDM. Abbreviations: FPG, fasting plasma glucose; RBG, random blood glucose; OGTT, oral glucose tolerance test; GDM, gestational diabetes mellitus; GCT, glucose challenge test; h, hour. The NIH consensus panel identifies as a priority the conduct of a new RCT evaluating outcomes in women currently classified as “normal” according to prevalent US criteria but who would be considered abnormal by the IADPSG and the ADA.18 The diagnosis of GDM is generally made in the late second or early third trimester. Early detection and treatment may potentially improve outcomes. However, there is a dearth of evidence in this area. Well-designed studies are needed to determine the most appropriate means of testing for GDM in early pregnancy and to explore the outcomes of early treatment interventions. Apart from the debate on other issues, the first step should be the implementation of universal screening to identify more severe cases of GDM. This step will already be a major one in most countries. The different viewpoints from experts and guidelines underscore the fact that there are data to support each strategy (IADPSG vs Carpenter and Coustan criteria; one-step vs two-step screening). The decision on which strategy to implement must therefore be made on the basis of the relative role of cost considerations, and availability of infrastructure locally, nationally, and internationally. In addition, patient preferences should be taken into account as part of any screening strategy. American Diabetic Association. Diagnosis and classification of diabetes mellitus. Diabetes Care. 2006;29(Suppl 1):S43–S48. American Diabetic Association. Classification and diagnosis of diabetes mellitus. Diabetes Care. 2015;38(Suppl 1):S8–S16. International Association of Diabetes and Pregnancy Study Groups Consensus Panel, Metzger BE, Gabbe SG, Persson B, et al. International association of diabetes and pregnancy study groups recommendations on the diagnosis and classification of hyperglycemia in pregnancy. Diabetes Care. 2010;33(3):676–682. Buchanan TA, Xiang AH, Page KA. Gestational diabetes mellitus: risks and management during and after pregnancy. Nat Rev Endocrinol. 2012;8(11):639–649. McIntyre HD, Colagiuri S, Roglic G, Hod M. Diagnosis of GDM: a suggested consensus. Best Pract Res Clin Obstet Gynaecol. 2015;29(2): 194–205. doi:10.1016/j.bpobgyn.2014.04.022. Houshmand A, Jensen DM, Mathiesen ER, Damm P. Evolution of diagnostic criteria for gestational diabetes mellitus. Acta Obstet Gynecol Scand. 2013;92(7):739–745. Coustan DR. Diagnosis of gestational diabetes. Scand J Clin Lab Invest Suppl. 2014;244:27–33. O’Sullivan JB, Mahan CM. Criteria for the oral glucose tolerance test in pregnancy. Diabetes. 1964;13:278–285. National Diabetes Data Group. Classification and diagnosis of diabetes mellitus and other categories of glucose intolerance. Diabetes. 1979; 28(12):1039–1057. Carpenter MW, Coustan DR. Criteria for screening tests for gestational diabetes. Am J Obstet Gynecol. 1982;144(7):768–773. World Health Organization. Definition, Diagnosis and Classification of Diabetes Mellitus and its Complications: Report of a WHO Consultation. Part 1: Diagnosis and Classification of Diabetes Mellitus. WHO/NCD/NCS/99. 2nd ed. Geneva, Switzerland: World Health Organization; 1999. HAPO Study Cooperative Research Group, Metzger BE, Lowe LP, Dyer AR, et al. Hyperglycemia and adverse pregnancy outcomes. N Engl J Med. 2008;358(19):1991–2002. Blumer I, Hadar E, Hadden DR, et al. Diabetes and pregnancy: an endocrine society clinical practice guideline. J Clin Endocrinol Metab. 2013;98(11):4227–4249. World Health Organization. Diagnostic criteria and classification of hyperglycaemia first detected in pregnancy. Diabetes Res Clin Pract. 2014;103(3):341–363. McIntyre HD, Metzger BE, Coustan DR, et al. Counterpoint: establishing consensus in the diagnosis of GDM following the HAPO study. Curr Diab Rep. 2014;14(6):497. Long H, Cundy T. Establishing consensus in the diagnosis of gestational diabetes following HAPO: where do we stand? Curr Diab Rep. 2013; 13(1):43–50. Ryan EA. Diagnosing gestational diabetes. Diabetologia. 2011;54(3): 480–486. National Institutes of Health Consensus Development Conference Panel. National Institutes of Health consensus development conference statement: diagnosing gestational diabetes mellitus, March 4–6, 2013. Obstet Gynecol. 2013;122(2 Pt 1):358–369. Committee on Practice Bulletins – Obstetrics. Practice Bulletin No 137: gestational diabetes mellitus. Obstet Gynecol. 2013;122(2 Pt 1): 406–416. Long H. Diagnosing gestational diabetes: can expert opinions replace scientific evidence? Diabetologia. 2011;54(9):2211–2213. Crowther CA, Hiller JE, Moss JR, McPhee AJ, Jeffries WS, Robinson JS. Effect of treatment of gestational diabetes mellitus on pregnancy outcomes. N Engl J Med. 2005;352(24):2477–2486. Landon MB, Spong CY, Thom E, et al. A multicenter, randomized trial of treatment for mild gestational diabetes. N Engl J Med. 2009;361(14): 1339–1348. Horvath K, Koch K, Jeitler K, et al. Effects of treatment in women with gestational diabetes mellitus: systemic review and meta-analysis. BMJ. 2010;340:c1395. McIntyre HD. 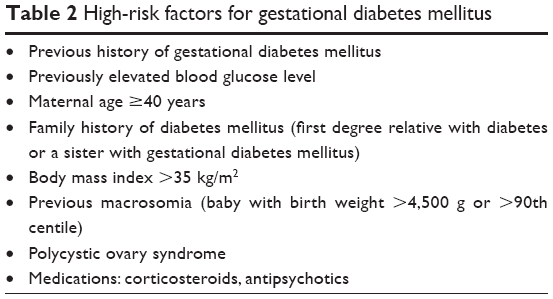 Diagnosing gestational diabetes mellitus: rationed or rationally related to risk? Diabetes Care. 2013;36(10):2879–2880. Catalano PM, McIntyre HD, Cruickshank JK, et al. The Hyperglycemia and Adverse Pregnancy Outcome Study: associations of GDM and obesity with pregnancy outcomes. Diabetes Care. 2012;35(4):780–786. HAPO Study Cooperative Research Group. Hyperglycaemia and Adverse Pregnancy Outcome (HAPO) Study: associations with maternal body mass index. BJOG. 2010;117(5):575–584. International Association of Diabetes and Pregnancy Study Groups (IADPSG) Consensus Panel Writing Group and the Hyperglycemia and Adverse Pregnancy Outcome (HAPO) Study Steering Committee, Metzger BE, Gabbe SG, Persson B, et al. The diagnosis of gestational diabetes mellitus: new paradigms or status quo? J Matern Fetal Neonatal Med. 2012;25(12):2564–2569. Falavigna M, Schmidt MI, Trujillo J, et al. Effectiveness of gestational diabetes treatment: a systematic review with quality of evidence assessment. Diabetes Res Clin Pract. 2012;98(3):396e405. Australasian Diabetes In Pregnancy Society (ADIPS) Consensus Guidelines for the Testing and Diagnosis of Gestational Diabetes Mellitus in Australia. Available from: http://www.bhs.org.au/airapps/Services/au/org/bhs/govdoc/files/references/14440.pdf. Accessed January 27, 2015. Donovan L, Hartling L, Muise M, Guthrie A, Vandermeer B, Dryden DM. Screening tests for gestational diabetes: a systematic review for the US Preventive Services Task Force. Ann Intern Med. 2013;159(2): 115–122. Zhu WW, Yang HX, Wei YM, et al. Evaluation of the value of fasting plasma glucose in the first prenatal visit to diagnose gestational diabetes mellitus in china. Diabetes Care. 2013;36(3):586–590. Harlass FE, Brady K, Read JA. Reproducibility of the oral glucose tolerance test in pregnancy. Am J Obstet Gynecol. 1991;164(2):564–568. Catalano PM, Drago NM, Amini SB. Reproducibility of the oral glucose tolerance test in pregnant women. Am J Obstet Gynecol. 1993; 169(4):874–881. Moses RG, Cheung NW. Point: universal screening for gestational diabetes mellitus. Diabetes Care. 2009;32(7):1349–1351. van Leeuwen M, Louwerse MD, Opmeer BC, et al. Glucose challenge test for detecting gestational diabetes mellitus: a systematic review. BJOG. 2012;119(4):393e401. Sacks DA, Hadden DR, Maresh M, et al. Frequency of gestational diabetes mellitus based on IADPSG consensus panel – recommended criteria at collaborating centers. Diabetes Care. 2012;35(3):526–528. Sermer M, Naylor CD, Gare DJ, et al. Impact of increasing carbohydrate intolerance on maternal-fetal outcomes in 3637 women without gestational diabetes. The Toronto Tri-Hospital Gestational Diabetes Project. Am J Obstet Gynecol. 1995;173(1):146–156. Yapa M, Simmons D. Screening for gestational diabetes mellitus in a multiethnic population in New Zealand. Diabetes Res Clin Pract. 2000; 48(3):217–223. Sievenpiper JL, McDonald SD, Grey V, Don-Wauchope AC. Missed follow-up opportunities using a two-step screening approach for gestational diabetes. Diabetes Res Clin Pract. 2012;96(2):e43–e46. Simmons D, Moses RG. Gestational diabetes mellitus: to screen or not to screen? Is this really still a question? Diabetes Care. 2013;36(10): 2877–2878. Goldberg RJ, Ye C, Sermer M, et al. Circadian variation in the response to the glucose challenge test in pregnancy: implications for screening for gestational diabetes mellitus. Diabetes Care. 2012;35(7):1578–1584. Sevket O, Ates S, Uysal O, Molla T, Dansuk R, Kelekci S. To evaluate the prevalence and clinical outcomes using a one-step method versus a two-step method to screen gestational diabetes mellitus. J Matern Fetal Neonatal Med. 2014;27(1):36–41. Rafat D, Ahmad J. HbA1c in pregnancy. Diabetes Metab Syndr. 2012; 6(1):59–64. Raiput R, Yadav Y, Raiput M, et al. Utility of HbA1c for diagnosis of gestational diabetes mellitus. Diabetes Res Clin Pract. 2012;98(1): 104–107. Lowe P, Metzger BE, Dyer AR, et al. Hyperglycemia and Adverse Pregnancy Outcome (HAPO) Study: associations of maternal A1C and glucose with pregnancy outcomes. Diabetes Care. 2012;35(3):574–580. Davies DM, Welborn TA. Glycosylated haemoglobin in pregnancy. Aust N Z J Obstet Gynaecol. 1980;20(3):147–150. Pollak A, Widness JA, Schwartz R. Minor hemoglobins: an alternative approach for evaluating glucose control in pregnancy. Biol Neonate. 1979;36(3–4):185–192. Widness JA, Schwartz HC, Kahn CB, Oh W, Schwartz R. Glycohemoglobin in diabetic pregnancy: a sequential study. Am J Obstet Gynecol. 1980;136(8):1024–1029. McFarland KF, Catalano EW, Keil JE, McFarland DE. Glycosylated haemoglobin in diabetic and nondiabetic pregnancies. South Med J. 1981;74(4):410–412. Colagiuri S, Falavigna M, Agarwal MM, et al. Strategies for implementing the WHO diagnostic criteria and classification of hyperglycaemia first detected in pregnancy. Diabetes Res Clin Pract. 2014;103(3):364–372.